FQ 法属南方和南极洲领地 French Southern and Antarctic Territories FQHH 参见：TF 和 FR-TF. ^ The International Standard Recording Code. 國際唱片業協會. ^ ISO 4217 currency names and code elements. ISO. ^ ISO6166 - an outline of the standard. 国际编码机构协会. ^ About BIC. 环球银行金融电信协会. （原始内容存档于2009-03-01）. ^ IBAN Registry (PDF). 环球银行金融电信协会. （原始内容 (PDF)存档于2010-01-02）. ^ 7.0 7.1 UN/LOCODE Code List by Country. 联合国欧洲经济委员会. [2017-05-06]. ^ 。 IANA – Root Zone Database. 互联网号码分配局. ^ Standard ST.3 – Recommended standard on two-letter codes for the representation of states, other entities and intergovernmental organizations (PDF). Handbook on Industrial Property Information and Documentation. 世界知识产权组织: 3.3.1–3.3.9. April 2007. ^ Publications Office – Interinstitutional style guide – Countries. 欧盟. ^ Distinguishing signs used on vehicles in international traffic (PDF). 联合国欧洲经济委员会. ^ 13.0 13.1 Codes to history: Code for formerly used names of countries completes the trilogy of country codes (PDF). ISO Bulletin. ISO: 10–12. April 2000. （原始内容 (PDF)存档于2008-12-12）. ^ Falkland Islands Government. [2016-12-22]. （原始内容存档于2016年12月11日）. ^ 15.0 15.1 ISO 3166 – FAQs – Specific. ISO. ^ Agreement between the Nordic Patent Institute and the International Bureau of the World Intellectual Property Organization (PDF). World Intellectual Property Organization. 2013-05-01 [2013-08-07]. ^ Mark Davis. Unicode Technical Standard #35: Unicode Locale Data Markup Language (LDML). Unicode Consortium. 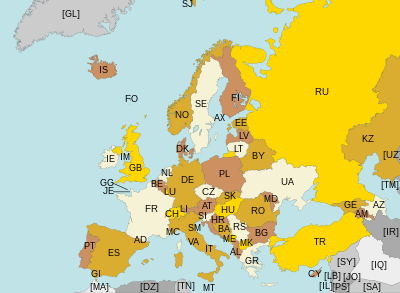 ^ Glossary:Country codes - Statistics Explained. europa.eu. ^ XK country code for Kosovo. GeoNames Blog. 2010-03-08. ^ Clive Feather. Country codes in ISO 3166 (Table 2: codes withdrawn from use). 2003-07-25.